What Is The World View Of A Biblical Christian? Your World View Reveals The Real You: So Who Are You? EVERYONE has a world view, but not everyone is aware of the one they hold. We all operate by a set of governing rules that we believe at our deepest core to be the “best” set for us. Some of us might claim to be pacifists in our praxeology yet when we are wronged, the first thing we seek to do is “fight” (either verbally, psychologically, or physically) to defend our position or worse, to “even” the score. This would demonstrate that we “think” we’re pacifists but our actions i.e. where the “rubber hits the road” would demonstrate that we more “passive aggressive” than “pacifist”. Most life paths are chosen during ages 18-28 whether they are wrong or right. A diverse set of underlying principles and values which influence and/or govern one’s thoughts, motives, and actions in all of life by way of how one sees the world and himself within it. It is the answer to “why” things happen, exist (or not exist). IIt answers “where” things (we) come from, what we are, and “where” they (we) are going. It is the motivation for one to act and to refrain from acting. It is the underlying reason for emotional response: i.e. fear, peace, etc. It is possessed by ALL humans everywhere – despite most being unaware of the one they hold. 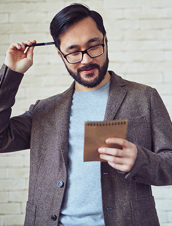 Epistemology – The study of knowledge and justified belief and how it is acquired, either before sensory experience (a priori) or only after sensory experience (a posteriori) - How we perceive and process information and differentiate between truth and falsehood. Philosophy of Politics – One’s view of proper governance of a society – how people should be managed regarding liberties, justice, authority, and legal codes of a given state - One’s preferred and normative state action and behaviour in managing society. 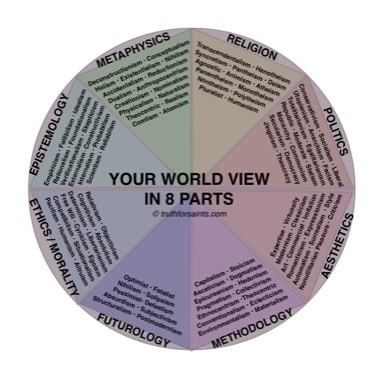 Although I’ve listed 8 basic, but universal philosophical categories that provide the primary composition of a person’s worldview, many of these world view categories may overlap into a category of another. i.e. Postmodernism is both a methodological and an epistemological approach to one's view of the world. 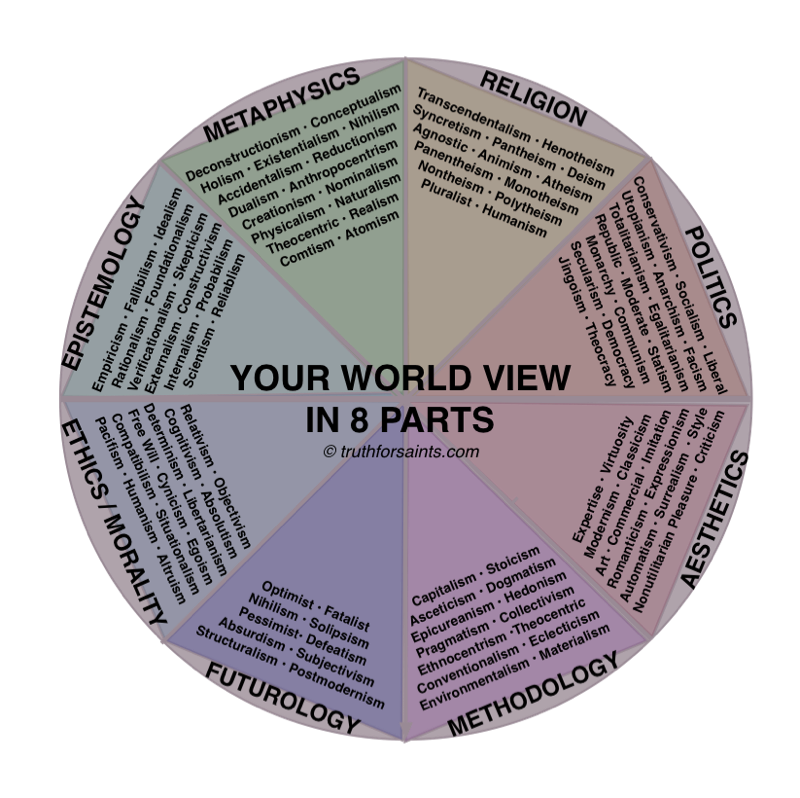 Also, there are other areas which also contribute to our worldview composition such as aesthetics or subcategories like one’s cosmology. But for the most part, we can suffice it to say that with the 8 identified categories above, we will arrive at a fairly accurate representation of our worldview makeup overall.